NASA's Cassini spacecraft will take a picture of Earthlings' home planet from the viewpoint of aliens on Saturn next month, snapping the image from hundreds of millions of miles away. "While Earth will be only about a pixel in size from Cassini's vantage point 1.44 billion kilometres away, the team is looking forward to giving the world a chance to see what their home looks like from Saturn," said Linda Spilker, Cassini project scientist at NASA's Jet Propulsion Laboratory. 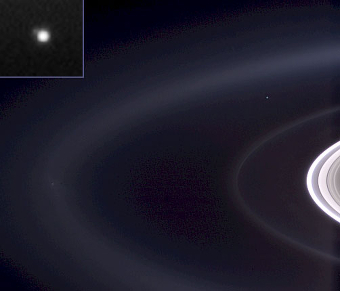 On 19 July, Earth will seem like a small, pale blue dot between the rings of Saturn in the image, part of a mosaic of the planet's system that Cassini is taking. Cassini has taken mosaics of the Saturn system twice before: once in 2006 and again in 2012. This, however, will be the first mosaic to capture the images with the Earth in natural colour. It will also be the first to use the craft's highest-resolution camera. "Ever since we caught sight of the Earth among the rings of Saturn in September 2006 in a mosaic that has become one of Cassini's most beloved images, I have wanted to do it all over again, only better," said Carolyn Porco, Cassini imaging team lead at the Space Science Institute.